Welcome to the Players Exchange website. Players Exchange has been serving the Harrisburg area for the last 20 years buying,selling, and trading affordable used guitars, basses, amps, keyboards, PA equipment along with vintage guitars, etc. We play top dollar for clean, used equipment from current to vintage, especially vintage Fender, Gibson, Rickenbacker, Martin and Gretsch guitars, amps, mandolins, and banjos. This store is owned and operated by accomplished bassist Scott Frange. 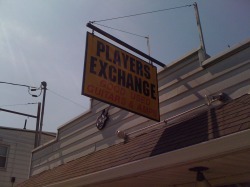 Unlike most music shops, Players Exchange is mainly involved with used equipment. Players Exchange is located on 225 S. 3rd St. just off of exit 42 on I-83 in Lemoyne, PA.